Probably the main reason Akira Kurosawa’s epic samurai masterpiece called Kagemusha has its rightful place among the most impressive movies we’ve seen so far is the simply brilliant idea that serves as the film’s basis. The play between reality and illusion, a theme most explored in Kurosawa’s filmmaking, lies in the heart of Kagemusha. As a poor thief is forced to become the powerful warlord’s double, since the warlord himself is gravely wounded in a battle, the central question becomes evident soon enough. When the smoke disappears, and the battlefield is littered with limbless bodies of soldiers who without posing any questions jumped straight to their deaths, what remains is nothing but a crucial problem written in blood on the land that saw great kings, magnificent warriors and too many tears to mention: what drives people to do what they have been doing for centuries? If there is a common man sitting on the thrones, wielding god-like power, determining who lives and who dies as if he’s choosing what kind of toast he’d prefer for his dinner, why are whole armies obeying his every word, ready to sacrifice their lives for him? It’s the collectively appreciated idea, the formed illusion of the masses, the illusion of power, the strength of symbols and the stubborn adherence to artifically crafted things such as honor and pride, that really sets the world in motion. Kurosawa’s period drama is beautifully designed, abundant in colors, perfectly slow-paced and decorated with powerful, highly symbolic images. Kagemusha is a poem; an incredibly sad poem that loudly and bravely brings our attention to the fruitlessness of violence, the absurdity of human nature, the seductibility of the human spirit. Kagemusha, written by Kurosawa and Masato Ide and brought to life with the help of Francis Ford Coppola and George Lucas, is a tragic story of human nature—if there’s a better way to describe it in so few words, we haven’t found it yet. One of the most important aspects of period piece storytelling is to explore in what way the past talks to the modern world, in what way history sheds light on the present. Kurosawa dealt with an uncomfortable truth of universal value and significance, making Kagemusha as omnirelevant as a film might get. For your reading pleasure: Kagemusha booklet; press kit, and other documents, courtesy of CineFiles. The DVD/Blu-ray of the film is available from the Criterion Collection. Absolutely our highest recommendation. Excerpt from a 19-minute interview piece in which directors George Lucas and Francis Ford Coppola discuss Kurosawa and Kagemusha. This interview appears on the Criterion Collection’s Kagemusha release. The following comments were originally made by Akira Kurosawa and published by Toho Company, Ltd., in 1975 as advice to young people considering a career in filmmaking. They have been adapted by Audie E. Bock. 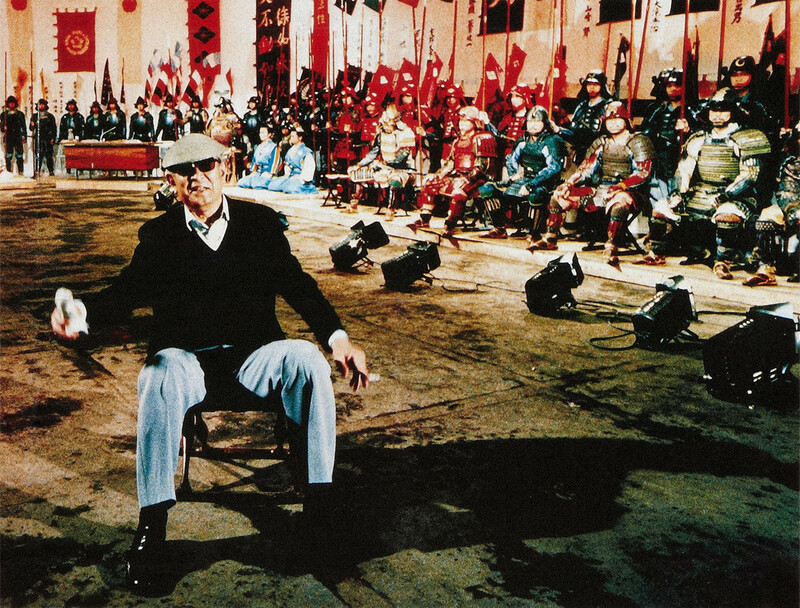 Alex Cox’s documentary on master director, Kurosawa: The Last Emperor (1999).